I don't think I have worn an outfit in awhile that I felt was just "pretty". I found this top at my local Anthropologie with an extra 30% off its sale price last week. It is actually a more modest crop top that has already paired so well with other pieces in my closet. I really love how this outfit has so many different lines happening with the textures and prints but they work so well together. Love that top! Pairs so well with the skirt! Cute skirt. You look great. such a cool outfit! love your heels! This look is so pretty! I love the skirt. This is definitely a feel pretty kind of outfit! 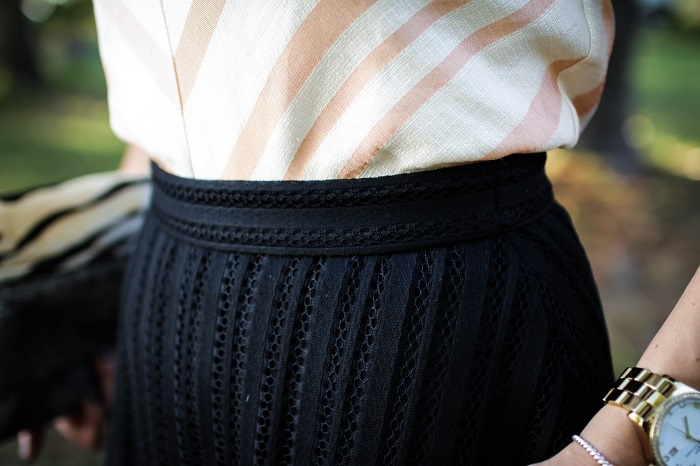 Love the detailing on your skirt. Such a great look! I'm not usually into chevron but this is done SO right. Anthro can do no wrong! You look so, so pretty! That skirt is amazing! Such a lovely elegant outfit!